= Nee ohanami ni ikanai? = Hey, do you want to go see the cherry blossoms? = Odango wa aru no? After a long cold winter, I finally feel the hint of spring in the air. = Haru wa mou soko made kite imasu. = Spring is just around the corner. If you are planning to come to Japan, it would be nice to visit in the spring. 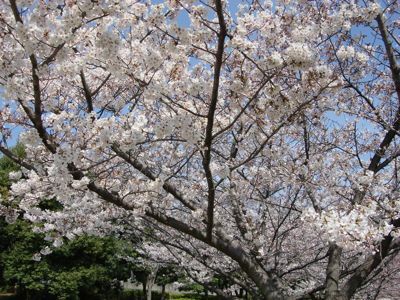 It’s a great chance to see our beautiful cherry blossoms. Today’s guest teacher is Basil Farrow. Remember him in ググるLesson? And this lesson is for his mom, La Carmina, the coolest Japan Goth blogger/TV reporter/author/journalist around. She will be hosting a Belgian TV documentary in Tokyo about what else? 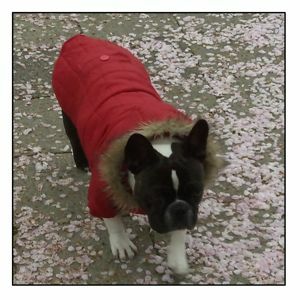 Cherry blossom season! So this lesson is about 桜 = sakura = cherry blossoms! • A fake customer or decoy, by the way, is called サクラ = sakura. = Watashi ga sakura ni natte kite ageyou ka? = You want me to be a fake customer (for you and help you) to get real customers? They start to bloom in late March and last through the beginning of April. Sadly, they only last for about a week. There are many kinds of cherry blossoms (over 200 kinds!!) but when they talk about this forecast, they are based on cherry blossoms called ソメイヨシノ = somei yoshino. = Sakura zensen ga hokujou shiteimasu. = The cherry blossom front is moving north. You can enjoy cherry blossoms in many places in Japan. Temples, parks, river sides, mountains, etc. 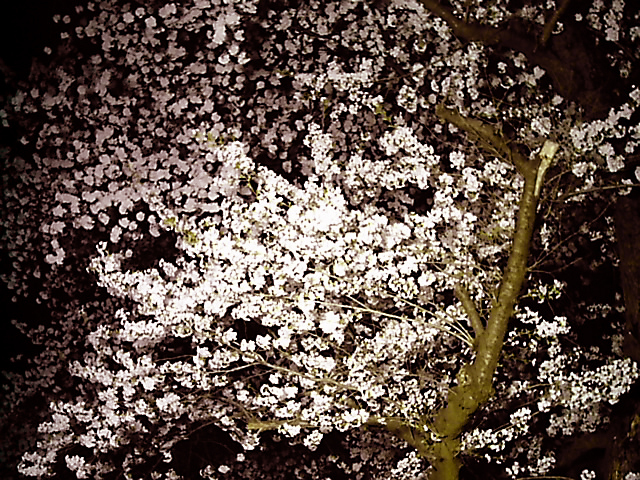 They are places where you can enjoy cherry blossoms illuminated by the lights at night. It is said that this cherry blossom viewing tradition started in the 7th century or perhaps even earlier. 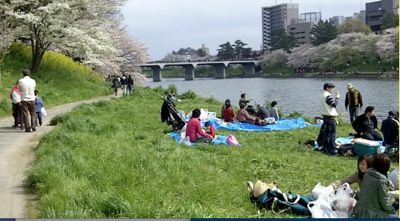 When we say 花見 ( = hanami) cherry blossom viewing 2 types of activities spring to mind. 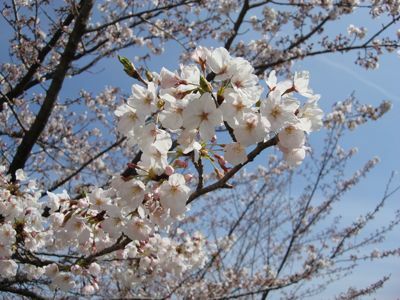 One type of 花見 ( = hanami) focuses on appreciating the beauty of the cherry blossoms themselves. But a lot time 花見 ( = hanami) is just a wonderful excuse to have a party outside. We eat and drink (and occasionally even sing Karaoke or even dance. ) beneath the cherry blossom trees. or they have drinking parties under the trees. Since everybody wants to have a drinking party under the beautiful cheery blossoms tree, it is always hard and hard to get a good spot. Many companies send their 新入社員 ( = shinnyuushainn) = new comers as its 幹事 = kanji = party organizer to stake out a good spot. It’s not uncommon for them to go there early in the morning or even the night before the party! So for a lot of people 花見 ( = hanami) means to eat and drink near the cherry blossoms. If you haven’t seen the lessons I made regarding drinking or alcohol related Japanese, you might wan to check those lessons now. Although Japanese have an international reputation for being shy and reserved, you will be surprised to see all the crazy antics that the Japanese people get up to as they drink, sing and dance under the beautiful flowers. For many Japanese, it is more fun to eat and drink than enjoy the flowers. = Nee, ohanami ni ikanai? 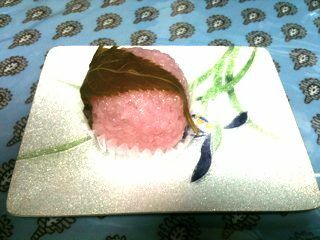 = Are there “odango” (= sweet dumpling) ? 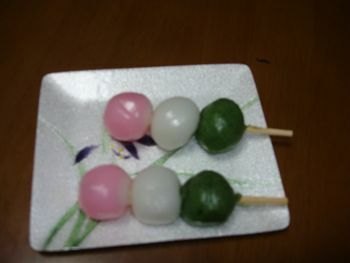 A typical hanami dango has three different colored dumplings on a stick. They are made of sweet sticky rice. The outside leaf is a real salted cherry blossom leaf and you eat it,too. You will also see a lot of other sakura related food or items in Japan in April. 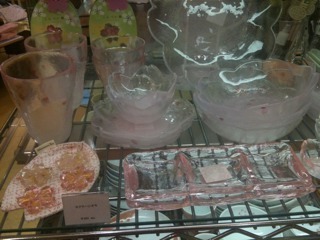 There are even cakes with cherry blossoms flowers. 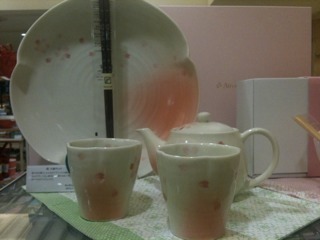 We also have tea cups, plates, table mats with cherry blossom design, etc. etc. 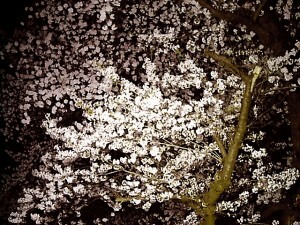 For many Japanese people 桜 = sakura = cherry blossoms are very special flowers. 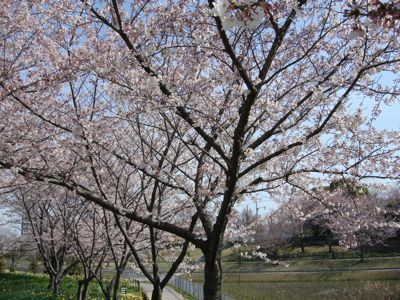 Some think that it is because 桜 = sakura only last for a short period of time. The beauty of the flowers won’t last long and it reminds you how short life is. But more than anything with the appearance of cherry blossoms, we feel the coming of spring, and they also symbolize a new start of the school year. Usually 卒業式 = sotsugyoushiki = graduation ceremonies are held in late March and 入学式(=nyuugakushiki = entrance ceremonies are held in the beginning of April. Many school yards have cherry blossoms so that it is customary for new students, especially new first graders (小学校一年生 = shougakkou ichinensei) to have their pictures taken beneath the cherry blossom trees. The image of sakura is not only associated with new school years but also corresponds with the time new employees start to work at Japanese companies as freshmen or freshwomen. 桜の季節 = sakura no kisetsu = cherry blossom season is a season to meet new people and also say good-bye to students. Some graduate from the University or high school and start to work in spring. Not just students but some businessmen also get transferred to new branches every spring. This song is a very traditional one. Almost all Japanese learn this song when they get to elementary school. = Ato suushuukan de kireina sakura ga arayuru tokoro de miraremasu. = In a few more weeks, you will be able to see beautiful cherry blossoms everywhere. = Minasan mo zehi kono kisetu ni “odango” wo tabe nihon ni kite kudasaine. = Come to Japan in this season and eat “dumplings”! Hello!!! Your name looks familiar. Do we know on FB? Good thing I came across your site, I really love reading your lessons. Keep up the good work sensei! Every time I hear sakura or spring, the song 花は桜君は美しい by いきものがかり comes to mind. ひさしぶり！Thank you for your comment. How is your kitty? 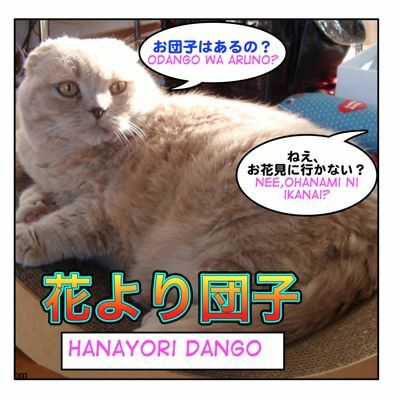 Anyway, 男子 is usually read as “danshi” but it is read as “dango” to make a pun. I discovered your blog about two months ago and I immediately liked it. I’ve been reading it since then but I was just too shy to leave a comment. I got worried after hearing the news on the incident last Friday. Even the headlines of the newspaper here in my country (Philippines) are talking about it. This seems to be one of Japan’s most challenging times but I believe you will overcome it. We will always be here to support you through prayers. We will keep posting useful Japanese lesson for all of you! How’s everything after the tsunami and earthquake? 心よりお見舞い申し上げます。Hope 皆さん are OK and life back to normal soon. Thank you for your concern on behalf of all the Japanese people. I know the sakurasakura song!i learned it drg my highschool. I like sakura girl but recently i found another song that i really like which is sakurae by yuzu. Really love that song. There is 1 traditional song that has seasons in the lyric and family members (haha/ chichi)/tomodachi. I dont really remember the exact lyric but its like “natsu no lalalala hito wa lalala you ni bokuno tomodachi” something like that. Yuzu’s 桜会 is a nice song,too!! Hum….I wonder what traditional song you are talking about. It can be 四季の歌= shiki no uta. Aaaaahh sou sou. This song! !I remember presenting this song to Japanese students when they came to my school when I was 14. I also hear this song in a drama called Aikurushii. I wish I can see the Sakura season. Also, does school end and start in spring in Japan? Hi, Kurosaki!! Thank you for leaving a comment. Yes, as I mentioned in the lesson, schools end and start in spring in Japan. Hope you come back to this site! and yeah I checked out La Carmina’s site after I saw it on here and watched her videos on there^^ she’s so cute and her english is perfect!! もちろん！I know 少女時代=SNSD. They are sooo cute! Good that you checked the La Carmina’s site. She is very cool!! You are right. We have a lots of seasonal events. What is your favorite season? I heard that Aki is usually a guys name though… and girl is usually "Akiko" ne? People tend to favor the season when they are born.